This WoodBridge T-0001 review might come across as a surprise to a lot of people. It’s a relatively new brand in the wide, crowded world of plumbing dominated by bigwigs like Kohler and Toto. But this toilet has been selling in droves in retail outlets as well as online portals. The reason? It’s crammed to the brim with features that rival much more expensive toilets. And to top it off, it comes at a very attractive price point. Here’s a detailed review of the WoodBridge toilet T-0001. The WoodBridge T-0001 is a one-piece toilet made of the finest ceramic. It comes from WoodBridge, a brand that has an impressive lineup of bathroom products including bathtubs, toilets, and basins. They are based in Cerritos, CA. We suspect that the products might be manufactured in China. But that’s not to take anything away from it. The T-0001 is their mid-level offering. It looks classy with skirted, contemporary design and a compact form factor that is well suited for bathrooms of all sizes and styles. It is available in three colors and there’s a square-shaped design in addition to the elongated bowl version. It has a standard 12-inch rough-in, making installation a straightforward procedure. Also included in the package is a soft-closing seat with rustproof, stainless steel hinges that makes it easy to remove the seat for cleaning and maintenance. To give you some perspective, a similar design from Kohler will cost you at least 200% more than what the WoodBridge toilet T-0001 costs. That too, without a soft-closing seat. This alone makes this a complete value for money package. And as if that wasn’t enough, WoodBridge also throws in a wax ring and floor bolts to boot. It’s an all-inclusive package that gives you everything you need for installation. 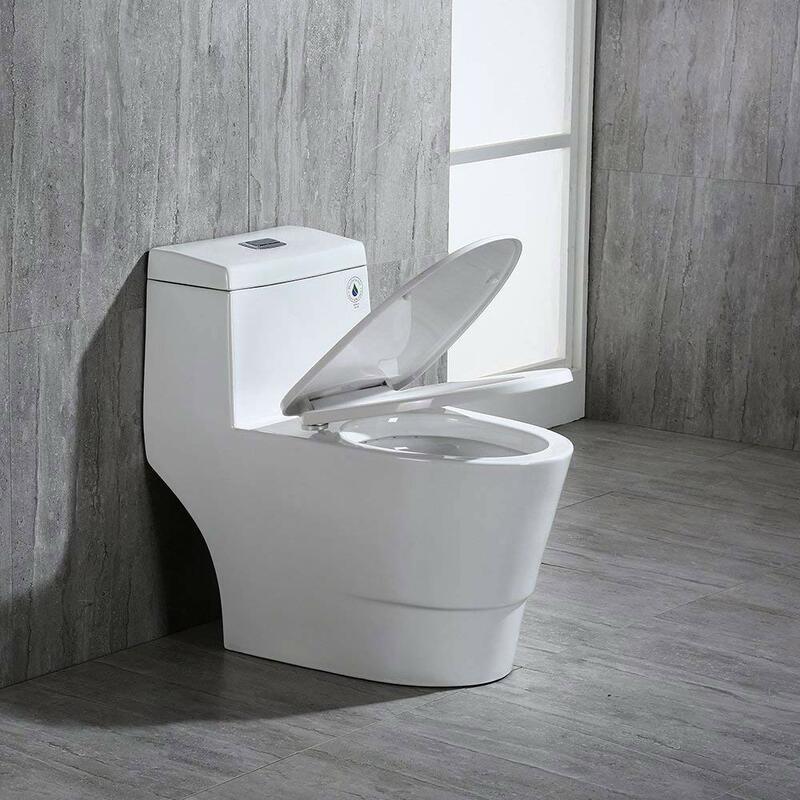 The T-0001 is a comfort-height toilet that’s 18-inches tall. Add another ¾” to that for the seat. And you have a toilet that’s exactly as tall as a chair, which makes it easier to sit on. Children might find that their feet don’t touch the floor. But that’s the tradeoff that comes with an ADA compliant toilet. The skirted, glazed trapway on the WoodBridge T-0001 toilet is designed for easy maintenance. There are no nooks and crannies in awkward angles that are impossible to reach. No crouching on all-fours to remove stains. A simple wipe down with a wet cloth should suffice to keep it as good as new. 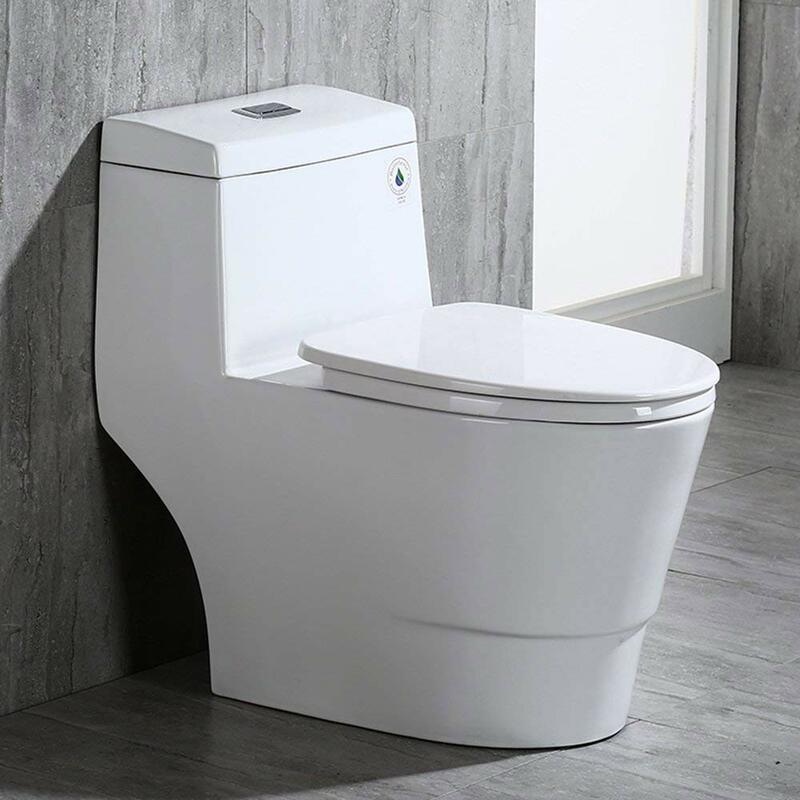 The WoodBridge toilet T-0001 features a dual flush, which means you can choose between a shorter flushing duration for liquids and a longer duration for solids. The shorter duration flush consumes 1 gpf while the longer one consumes 1.6 gpf. The average consumption though is a pleasant, WaterSense compatible 1.28 gpf. The siphon action creates a very powerful suction that removes the waste with no traces or skid marks. A single flush usually suffices to clean the bowl. In very rare instances, if there’s a slight stain or mark, then a short second flush should take care of it. Overall, it’s a very impressive package at the price point. The flush comes with a rectangular button that’s positioned on the top of the casing. It’s not a lever on the left of the flush like in newer models. This can be a tad uncomfortable if you wish to flush while you are seated on the toilet. The St. Tropez Toilet from Swiss Madison is another popular mid-level entrant into the market. It’s a one-piece toilet that looks like a mirror replica of the WoodBridge T-0001. The only difference is in the pricing and that too is miniscule. Which one would you choose if given a choice? Both the toilets have a contemporary, sleek profile with a skirted design. 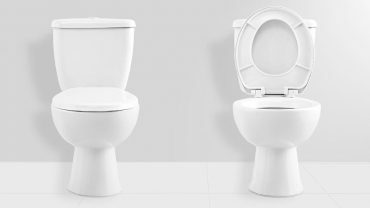 Both are comfort height toilets and come with soft-closing seats. The only difference is the height of the flush tank. The top of the flush tank is 27.5 inches above the ground in the WoodBridge T-001 whereas it’s 31. Inches on the St. Tropez. The extra height might make it more difficult to reach the flush button, which is again bang in the middle of the tank. The St. Tropez also features a dual flushing system like the T-001. However, it only uses 0.8 gallons per flush for liquids and 1.28 gpf for solids. If you are looking for a more water efficient option, then St. Tropez might be a better choice. However, there have been multiple instances where the flush didn’t clean the St. Tropez toilet efficiently. The customer reviews for WoodBridge T-0001 are largely positive whereas it’s a mixed bag for St. Tropez. Despite the identical designs, the WoodBridge T-0001 is clearly, the more efficient choice. It’s an all-inclusive package and at the price point, you’d be hard pressed to find a better option. Highly recommended!